I love my glasses and everyone knows. That is a statement of fact. They do tend to give me a headache because even after 4 months, they are still new to my existence. However, if there was a way I could wear them without getting my makeup ruined, I'd wear them every single day. Another reason, I love them is how they make my eye makeup pop...literally. I'm not an overtly colourful or flamboyant person when it comes to makeup on myself but I'm all for the irregular splash of colour especially on the lower lid. +Jordana Cosmetics retractable pencils are my go-to product for this and I usually have at least a blue & green Jordana pencil within reach. I wanted a clean look with a pop of colour for this look and in such cases I reach for the bronze shade in the +Sleek MakeUP iDivine Original palette so that's what I did. I then whipped out a random Jordana bright blue pencil and used it on my lower lid to create the pop of blue in the images. See how my eyes seem to be the centre of attraction in the images where I have my glasses on? 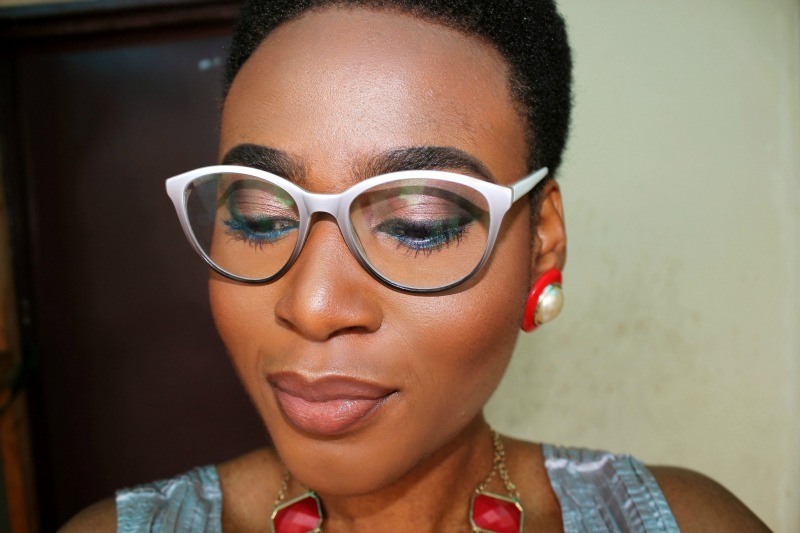 I'd say though that the fact that my glasses are a contrasting ombre shade when compared with my skin and makeup also helps to create that illusion. Or is it an illusion?